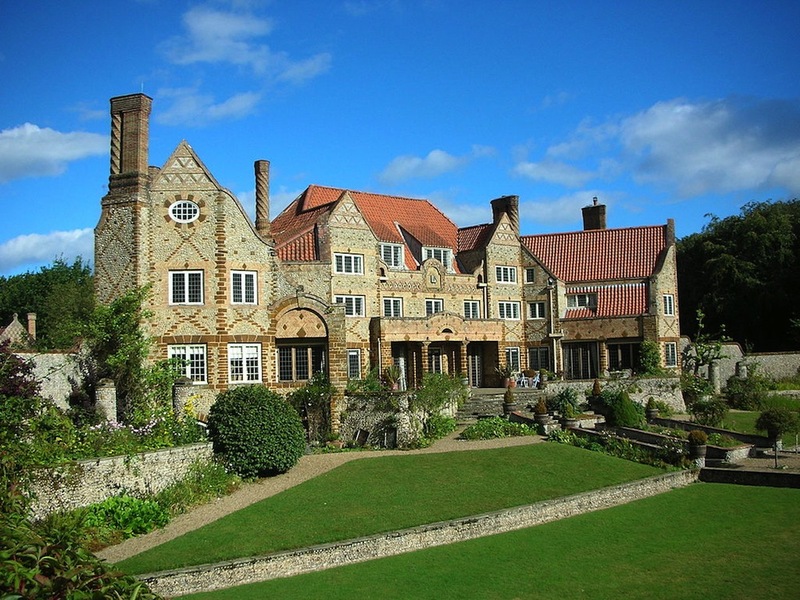 Voewood House, also known in the past as Home Place and Thornfield Residential Home, Norfolk, by Edward Schroeder Prior (1852-1932), 1903-04, with the Scottish architect Albert Randall Wells superintending. This is a Grade II* listed country house,set in Grade I listed gardens, which is built of "mass concrete faced with uncoursed flint, carstone quoins, carstone and on-edge tile decorations, pantile roof," and has five bays on a butterfly plan (listing text), giving it a highly decorative and enveloping presence. Nikolaus Pevsner calls it this architect's "most lavish and at the same time most violently idiosyncratic house" (168). But the locally sourced stone facings and tiles with their warm, cheerful tones give it a welcoming look. It has an impressive main entrance, with a vaulted vestibule and great central hall with an inglenook fireplace, the latter also on a grand scale. Surprisingly, it was originally built for a Rev. Percy R. Lloyd. Sensitively restored by its current owner, it is now used as a wedding and events venue, and is situated in High Kelling, Norfolk. Along with St Andrew, Roker, Voewood is considered to be one of England's best Arts and Crafts houses, and one of Prior's masterpieces. According to Pevsner, it cost more to build than Prior's Cambridge Medical School, the enormous sum in those days of £60,000 (168); but Martin Cook, in correspondence with the present author, says that this was a popular misconception derived from a mistaken newspaper report, and most unlikely in view of Prior's known frugality, both personally and professionally. Cook himself sets the cost at around a much more modest £8,000, still a great deal at the time, but perfectly good value for money. — Jacqueline Banerjee. Photograph by Gavin.collins, with thanks to him and to Wikipedia; it is available for reuse, with attribution, on the Creative Commons License. Click on the image to enlarge it. Cook, Martin Godfrey. Edward Prior: Arts and Crafts Architect. Marlborough: The Crowood Press, 2015. See Chapter 6, beautifully illustrated with photographs of Voewood as it is now, after restoration. Pevsner, Nikolus. North-East Norfolk and Norwich. Buildings of England. London: Penguin, 19. "Thornfield Residential Home for the Elderly." British Listed Buildings. Web. 12 June 2016.